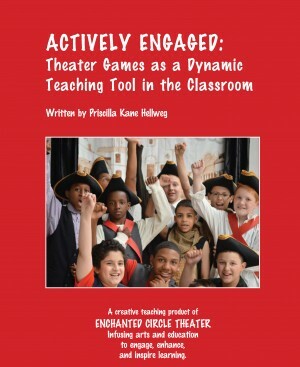 Actively Engaged is a manual for teachers interested in infusing theater games and arts integrated activities into their daily classroom life. It is designed to be a practical resource, in all content areas and grade levels, with strategies and techniques to help engage students in the inspiring and creative process of learning. This book was born out of Priscilla’s thirty-five years in the classroom as a teaching artist. Supported by evidence-based research on how the arts enhance learning, Actively Engaged illuminates how arts integrated experiences prepare students for academic achievement and develop their social and emotional competency. Road-tested techniques to engage students and keep them on-task through creative learning experiences in class. Brainstorming strategies that elicit critical and creative responses and get students invested in their own learning process by tapping into their creativity. Theater games that build effective communication skills, expand self-awareness, develop self-control, and authentically create a respectful classroom culture. Arts integration activities that help students comprehend complex academic concepts, and enable students to demonstrate their knowledge through creative education presentations. Activities that heighten student’s ability to collaborate productively, and support their sense of self-esteem and social confidence. Activities that develop problem solving skills, academic independence, artistic sensibility, empathy, and social responsibility. Over the past 35 years, Priscilla has worked in countless classrooms throughout New York and New England as a teaching artist with the Enchanted Circle Theater. She has developed and facilitated artist-in-residence programs in urban, rural, and suburban schools, with students from preschool through college. She has worked with teachers in district-wide professional development programs, in personal coaching sessions, and in teacher-training Institutes. Priscilla has also worked with adjudicated youth living in detention centers, young adults diagnosed with mental illness, senior citizens in assisted living programs, case workers in social service agencies, and adults in adult learning centers. The games in this collection have been adapted to suit each one of those environments and learning groups. please email us at info@enchantedcircletheater.com or call (413) 534-3789.